Sometime overnight Tuesday, someone — or some people — made a giant snow bear on the Lachine Canal, near Beaudoin Street in the Montreal neighbourhood of Saint-Henri. It's a delightful bear, carefully conceived and expertly executed. The bear's outline was stamped out right next to a footbridge crossing the canal in southwest Montreal — a prime location for picture-taking. But how did its mysterious makers do the belly button? It's hard to tell from the picture, but the bear is giant. There are easily two metres between the bear's sides and the belly button. Do you know who made the bear? Get in touch with us. That's not an easy jump. So how did they make the belly button? Here are some theories making the rounds on social media. This is a widely held theory. Occam's razor — the philosophical principle that the simplest explanation is the correct one — would suggest they jumped. But it's a problematic theory. First, the bear is on the canal. It's icy. There are no skid marks in the middle to suggest any slippage. Second, it's a really long distance to jump. It seems unlikely that anyone would be able to execute a jump so flawlessly without leaving any other marks in the snow. On to the next theory. Again, unless these people are competitive bocce players, it's hard to believe. The belly button is too perfect. There are four indents in the snow. What are the odds the button's maker threw four perfect snowballs in a row? Nevertheless, this is a popular theory. snowball. Or aliens. but probably a snowball. It is conceivable that a drone dropped snow from the sky to create the belly button. But that seems a bit elaborate for something that will likely disappear in a couple of days. Various people have suggested the artist or artists had some sort of stick, such as a hockey stick, to make the belly button. The bear's eyebrows look like they could have been made by a stick, as well. 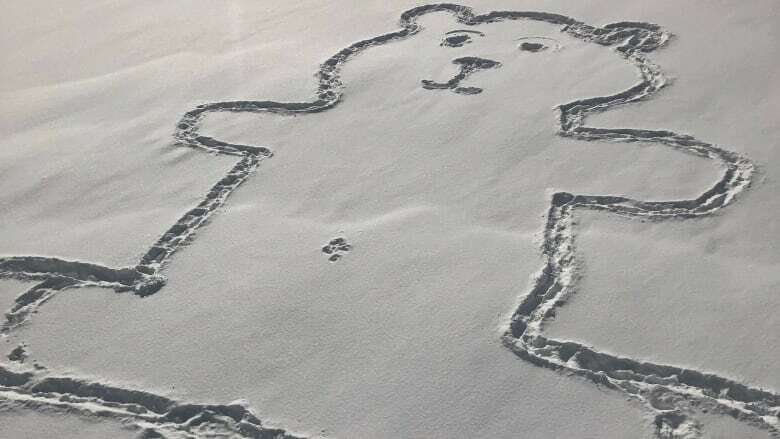 It's possible there were already four indents in the snow that may just have inspired the idea of making a belly-buttoned bear in the first place. A masterful bellybutton takes a skilled hand. BUT I am not above the theory that perhaps the bellybutton was made *first* (Ice falling? Bird landing?) and someone drew the bear around after the fact, thus negating the need to jump/throw at all. The timing would be difficult, though. It snowed until 5 a.m. Wednesday, and the belly-button indents are exactly the same depth as the outline of the rest of the bear. The bear, and the indents, would have had to have been made after the snowfall ended. Join the conversation about the mystery on CBC Montreal's Facebook page.